Best of the West Productions (BOTW) initially formed in 2003 as a hunting television production company, formerly known as Bridger Trails Video. Their specialty was long range hunting and the system of choice was a 7mm Magnum with a Leupold VariX 3 scope. As BOTW used these systems, they found various shortcomings and began developing their own high quality custom gun and a rifle scope that incorporates ballistic information in a turret-reticle design. In 2007 BOTW rolled out the Huskemaw 5-20×50 rifle scope with a custom calibrated turret that matched a specific load in a specific rifle to a specific elevation and temperature. This rifle scope was the first of its kind and, with BOTW proprietary software, was able to precisely calculate a bullet’s trajectory in specific environmental conditions. BOTW could also precisely calculate the amount of wind deflection that would occur and give shooters the means of compensating for wind drift. The BOTW philosophy, which flies in the face of philosophies that have stood for generations, was not welcomed in the hunting community: (1) Bullet performance is more important than velocity; (2) Ethical hunting can occur beyond 300 yards and even at extreme ranges; (3) Compensating for wind drift is not a guessing game. BOTW television series was the means to prove all were wrong. They demonstrate time and time again that shots at extreme ranges are possible with this technology. As news began to spread, Best of the West emerged as the Long Range Hunting Authority. The success of the television series has led to the online retail store, LongRangeStore.com, which carries gear featured in the show, and a custom ammunition product line, which is specifically for extended ranges. 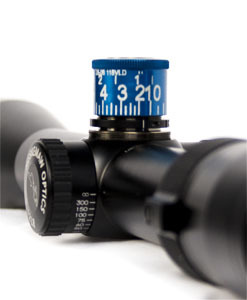 Featured products: Huskemaw Blue Diamond 5-20×50 rifle scope ($1,349), Huskemaw Blue Diamond 3-12×42 rifle scope ($999). Products can be purchased from LongRangeStore.com or 130 dealers located across the country. A map of dealers is located at HuskemawOptics.com. Long range rifle systems can be custom ordered. This entry was posted in Uncategorized, WY Hunting & Fishing, Wyoming Business, Wyoming First Spotlights and tagged Best of the West Productions, Huskemaw Blue Diamond, Jack Peterson, Long Range Hunting Authority, www.huskemawoptics.com, www.longrangestore.com, Wyoming Business Council, Wyoming First. Bookmark the permalink.